Scrymea is my personal setting. 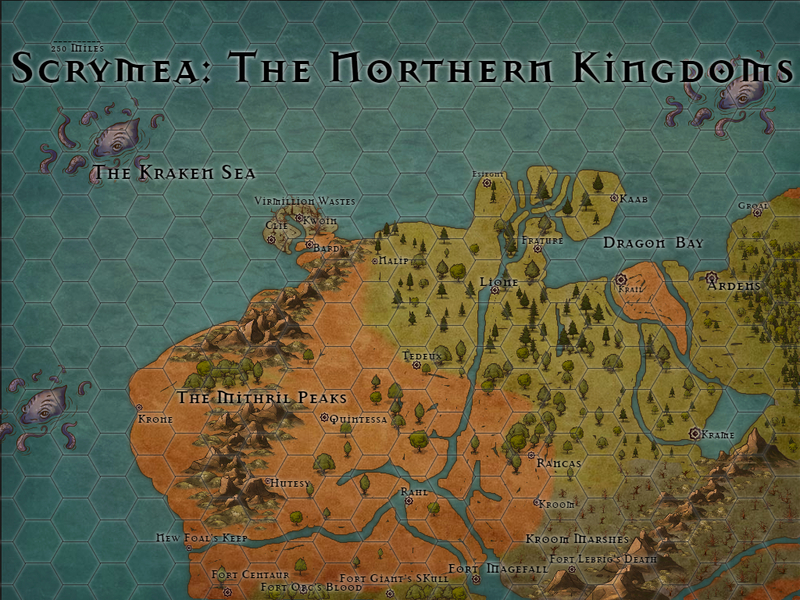 Most of my fantasy work will take place in the world of Scrymea, even if they do not call the world by its name. After all how often do you mention that you are on planet Earth? My goal is to post all the different aspects of the world that I come up with, and when I have enough gather them into one single reference. It will be primarily for me, but available to whomever else has taken an interest. That won’t be for a while. The first region I am focusing on is the Northern Kingdoms. 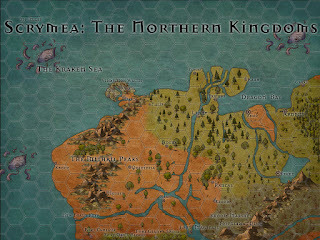 The Northern Kingdoms are located on the north western most portion of the largest continent of Scrymea. The climate of this region is primarily temperate, or at least it should be. In a world where powerful wizards and truly devout priests can call upon powers to change the weather, climate is more of a rough guide. This region experiences summer, winter, spring, and fall. This is a land of contradictions. At any one time one kingdom will be warring with another. Their borders change so often that they are rarely shown on any map. About the only thing that unites the Kingdoms is the threat of the ever expanding Panthic Empire to the south, not shown here. Also not shown on the map is region of Rock Darr. Rock Darr was once a powerful kingdom, one to rival the Panthic Empire, and some even believed that it would rival fallen Eldara of old. Whether or not that was a possibility no one will ever know for sure as the kingdom was overwhelmed by undead and a vicious species known as lebrigs. Some describe the creature as an oversized gerbil with an oversize and carnivorous appetite. Occasionally undead and lebrigs make their way west, and the kingdoms in their way have become more than experienced in how to deal with them. The threat of conquest from the south and painful death from the east has shaped the peoples of this region in such a way that they are among the few that dare sail the Kraken Sea. If you wish to Travel to the Druid Isles or the Lands of Frozen Wealth you’ll need to pay for berth on a northern vessel. It is this source of trade, as well as the line of forts and fortifications known as the High Guard Line that discourages the Panthic Empire form bringing its full might down upon the region. The High Guard Line and the High Guard who man the forts are yet another contradiction as they seem to be a uniting element within the Northern Kingdoms. The High Guard are a monastic order dedicated to keeping the Northern Kingdoms safe. As such they have free rein wherever they travel. When a High Guard speaks a king listens. The High Guard accept recruits at any of their fortified abbeys, in addition to always keeping an eye out for potential candidates through the great cities and small towns of the north. Of all those who petition to join only one in ten survive the training. This is a small portion of what I have so far, changes will happen as well as focus on more specific areas as I write more and more within the setting. As always comments and critiques are welcome, keep them polite but honest.